Ultra Music Festival 2015 has been held in several countries, one of the countries hosting the largest music festival is Indonesia. Bali Indonesia is a main point of Ultra Music Festival. This music festival is named Ultra Beach Bali. Utra Beach Bali by Ultra Music Festival will be held on 24 and September 25, 2015. Based on the date of the event, the festival will take place over two days in Bali. But not conveyed any artists who will perform in this festival. One very burdensome on the implementation of Ultra Beach Bali by Ultra Music Festival is a very expensive ticket. Ticket prices offered relatively expensive for the citizens of Indonesia, especially Bali residents. Based on a press release from the promoter on Wednesday, June 17, 2015, Ultra Beach Bali tickets will be on sale from 22 June 2015. There are three classes of tickets to be able to witness one of the biggest dance music festival in the world for two days. Sales of tickets for the first period is Pre-Sale, tickets will be sold at a price of Rp. 2100000. 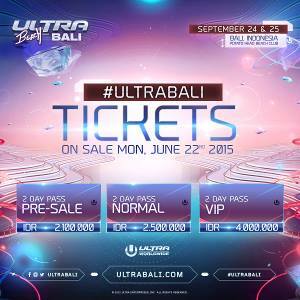 Tickets for the Ultra Music Festival Ultra Beach Bali at the normal price is Rp. 2500000. While most high-class tickets are VIP, these tickets are sold at a price of Rp. 4000000. For further information about tickets, can directly check the official website at www.ultrabali.com.